Pretty Pooches Points Of View! : Preparing a foster dog for his new home! Preparing a foster dog for his new home! If you are fostering a dog, there is much more to it than just finding another home to go to. This is some of the things we do to make sure the dog is ready for their new home. Vet Care - We make sure the dogs health is ok. In some dogs, there is nothing needed to be done, in others there may be health conditions that need treating, they may need their teeth cleaned or need some extractions, and they will be spayed or neutered if this hasn't already been done. Micro-chipping - If the dog comes to the charity without a microchip then they will be micro-chipped. If they already have a chip then their details will be updated. Training - Many dogs come with some training but we try and make sure all the dogs we foster know the basics at least. Learning to Sit, Wait, Walk on a lead, Give back a toy/chew etc. This ensures that when they go to their new home they know what is being asked of them, and also allows them to bond with their new family through the training. Socialization - If the dog isn't socialized with other dogs, with people etc then they will be taken out and socialized with as many people and friendly dogs and animals as possible. Even if the dog is well socialized this is all done to ensure they keep it up. Grooming - Every dog needs grooming of some sort. Their nails are clipped, they are given a bath, dried, and combed through if they have a long coat. If they are a breed who needs it, they will also be clipped to keep their coat short and in manageable condition. If the dog comes in with a matted coat, this will all be shaved off as matting is very painful for them and can also cause sores, cuts and infection of the skin, and harbor parasites such as fleas and more. If we can get the dog used to grooming and handling, then it makes things much easier for new owners or a professional groomer if you use one. 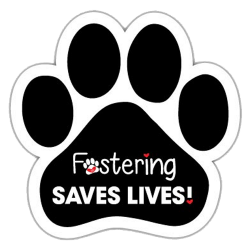 New Items - Any dog I foster is given a new collar or harness, lead, blanket or bed, and toys. This makes sure they go to their new home with familiar items with their own scent on. This helps the transition and is less stressful for them. These are the main things that a foster carer has to do for each dog in their care. No matter how long the dog is with us, how well they are, or what special needs they have, they always have the very best of care as if they are one of my own pack.